Paul McCartney has announced the first round of dates for his Freshen Up 2018 Tour. The trek coincides with his newly announced Egypt Station album due September 7th on Capitol Records. The first dates announced are for the Canadian cities Quebec City, Montreal, Winnipeg and Edmonton. 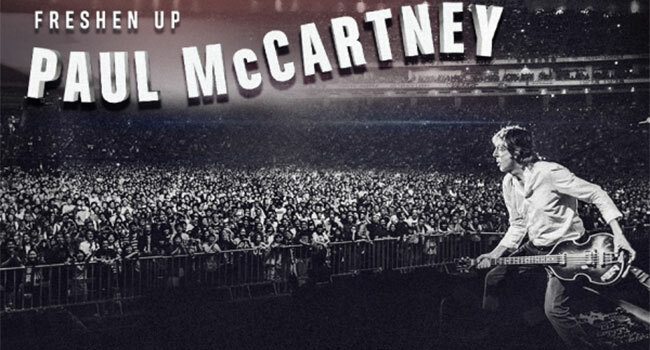 Freshen Up will begin September 17th at the Videotron Centre in Québec, McCartney’s first show in the Canadian capital since his 2013 stop at the Plains of Abraham on the Out There Tour. From there, the former Beatle will visit Montreal for the first time since the On The Run Tour in 2011 to play the Bell Centre on September 20th, before returning to Winnipeg September 28th to play Bell MTS Place, his first performance in the capital of Manitoba since 2013. Freshen Up’s Canadian itinerary will conclude with a visit to a final Canadian capital city, Edmonton, Alberta, for a September 30th show at Rogers Place, his first appearance in the city since 2012. The PaulMcCartney.com Verified Pre-sale starts Tuesday, July 10th at 10 am local time. Registration for the Paul McCartney Pre-sale powered by Ticketmaster Verified Fan will close Sunday July 8th at 10 pm ET. If verified and selected, you will receive your code via text message, two hours before your Verified Fan pre-sale begins. Due to the limited quantity of tickets, they will be available on a first-come, first-served basis. American Express Card Members can purchase tickets before the general public. The American Express pre-sale begins Tuesday, July 10th starting at 10 am local time through Thursday, July 12th at 10 pm local time. Tickets will go on sale to the general public on Friday, July 13th at 10 am local time. McCartney will follow Freshen Up’s Canadian run with headline sets at the 17th annual Austin City Limits Music Festival. The historic bill includes his debut ACL Fest performance and only North American festival appearance of 2018, topping a lineup featuring Metallica, Childish Gambino, Arctic Monkeys, Travis Scott, The National, Hozier, St. Vincent, Janelle Monáe and more than one hundred other artists. The festival takes place October 5th-7th at Zilker Park in Austin, TX.